What is the best way to prepare for the firefighter entrance exam? This is one of the most common question we are asked, especially from candidates who have never taken a firefighter entrance exam before. We can break this answer down into a few basic principles. First, begin your preparation early. Firefighter positions are incredibly desireable and therefor very competitive. Many candidates travel great distances to take entry tests for practice. If you have never tested before this places you at a disadvantage right away. Begin your preparations early by refreshing some basic skills you used in high school. These skills are things such as basic math, verbal reasoning, reading comprehension, mechanical aptitude, and reading tables, charts, maps, and graphs. Begin by refreshing your skills in these areas. You can use old textbooks or buy a entrance exam preparation book. 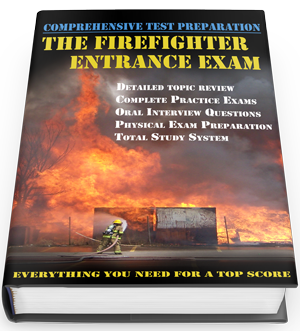 We are partial to our firefighter entrance exam preparation ebook because it is so comprehensive. Second practice taking tests. As we said earlier you can drive to other departments that are testing and take their tests for practice. This is a great tool, but not a cheap option if you have to drive long distances. Another option is to buy a test prep book that includes practice tests, such as ours. These will cover every area that is commonly tested and provide you with an answer key. Third, be persistent. In this world of instant gratification its hard for many candidates to remain on their journey to be a firefighter if they don’t immediately succeed. Be sure to maintain all of your training and medical certificates during your job search. You never know when positions may open up. Also be sure to keep your resume up to date and accurate. Below is a link to our Firefighter Entrance Exam Preparation Ebook. I received an email from a customer who recently purchased our Fire Engineer Interview ebook containing questions used from actual fire engineer interviews. We had a conversation about one question that was not covered in our book and discussed the best way to approach answering it. We have since added the question to our book. Below is an excerpt from his email. Key Points: This is a situation that is not tolerated. You have no way of knowing how much alcohol is in his system and he is not in any condition to work. The firefighter needs to be immediately removed from all apparatus and send for a fit for duty evaluation. Most departments have a procedure for this. After being removed from duty, he will be disciplined. Example Answer: This situation cannot be tolerated in any fire station because it is a safety hazard. This individual could harm himself, a crew member, or a citizen. I will make sure that he does not respond to any calls and immediately report the situation to my company officer. This firefighter needs to be removed from the apparatus and sent for a fit for duty evaluation. As an engineer I will not let my truck respond to a call with this individual on board. This information has been added to our Fire Engineer interview Ebook. It contains over 80 interview questions used in actual fire engineer interviews. We have posted firefighter job listings in Alaska and Alabama to our firefighter job listings page. The firefighter job listings are organized by state and include links to either the fire department’s home page, or the city’s human resources department. One of these sites will have the information in order to fill out a firefighter application. The application is the first step in the process of getting hired. 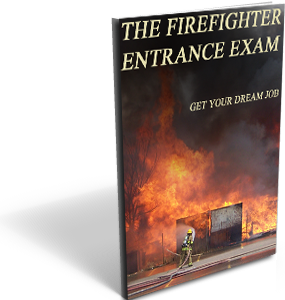 Our Firefighter Entrance Exam ebook covers the entire application process and then teaches you how to study effectively. It prepares you for each part of the written exam including math, reading comprehension, map reading, memory recall, verbal reasoning, and mechanical aptitude. It also includes a comprehensive section on the physical ability test and the oral interview. After you view our firefighter job listings go ahead and check out of firefighter entrance exam ebook. Our newly updated book with Fire Captain and Fire Lieutenant Interview questions has been updated with several new questions. These came from recent fire captain interviews in California and Texas. Below is one of the newly added questions. Please describe for the panel the different levels of progressive discipline that a Captain can administer in our department. Eric’s Answer: Our standard operating procedures are very clear with regard to progressive discipline. The different levels are: coaching, verbal counseling, verbal reprimand, written reprimand, suspension, and termination. As a Captain on the department I can directly administer all levels up to a written reprimand. Suspension and termination are handled by the Battalion Chiefs and Fire Chief. Discipline is the process of correcting unwanted behavior, my goal will be to set clear expectations and correct any problems with coaching, before they grow into larger problems. If I have to move up the discipline ladder I will carefully document all of my actions and keep my Batallion Chief informed of the situation as it progresses. If the process goes to suspension or termination, I will continue to support the command staff and work to correct the problem. Thanks for the email Eric! You can find this question and many more in our newly updated Fire Officer Interview Book. A fire officer interview is arguably one of the most stressful events of your life. Mental preparation is a key to a successful interview. Here are a few ways to be mentally prepped and ready for this critical event. 1. Study regularly. You should not be attempting to cram in the days right before an interview. Set a study schedule and stick to it. The day before the interview should consist of a brief review and some time to relax. 2. Sleep. Numerous study have shown that most people test better if they go to bed rather than forgo sleep to study. The studies also show that getting up early to review is more beneficial than sleeping in late and not reviewing. 3. Eat breakfast. Your body recalls information better when you eat breakfast. It is also shown to improve critical thinking and reasoning skills. 4. Arrive early to the interview. This gives you plenty of time to relax in you car or inside before the stress begins. 5. Know that you studied the correct material. These interviews are incredibly difficult. The biggest way to reduce your stress is to know that you studied the correct material. 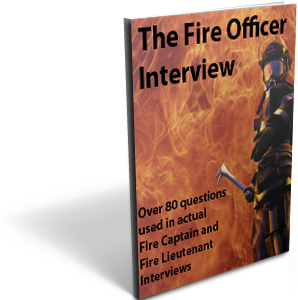 If you purchased our Fire Officer Interview Questions ebook you will be studying over 85 questions that were used in other Fire Officer interviews. Our customers are reporting that our ebook covers over 90% of their interview questions. This is the single greatest way to reduce stress and build confidence when going into a life changing interview. Below is a link to our product. 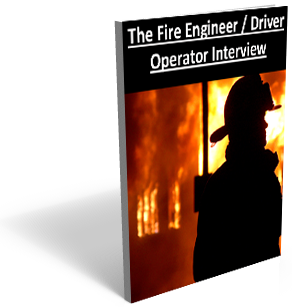 Over the last few months we have been collecting feedback from our customers who purchased the Fire Engineer / Driver Operator Interview Ebook. After they complete their interview we ask if our guide was helpful, and if they were asked any questions not covered in our ebook. If we feel the questions are good enough they could be asked in interviews for other departments, then we add them to our ebook. Most of our customers report that our guide covers roughly 90% of the questions asked in their interviews. We are pleased to have added 7 new questions related to apparatus positioning, personal accountability, common hose practices, department SOPs, and “fill-in” status for officer. Our updated fire engineer / driver operator ebook is now on sale. Just click the link or the picture. We have updated our Fire Officer Interview Questions ebook with several new interview questions that were asked to our customers over the summer. The questions relate to progressive discipline, personnel problems, SOP questions, and even very basic attire questions. All of these are very common questions that are asked in interviews for Fire Captain and Fire Lieutenant. You can purchase our new and updated Fire Officer Interview ebook by clicking the image below. Be sure to keep an eye out for our updated Fire Engineer Interview ebook, which releases next week! Jason, Thanks for your help with the new download link for my work computer. I went over your questions for two weeks every night. My interview panel consisted of the Fire Chief, two Assistant Chiefs, and two Battalion Chiefs. They asked me 11 questions. I wrote them all down when I got outside to my car. As I looked back, 9 of them were almost verbatim from your guide. One question was very specific for our department, however the last question was pretty general and something you may want to add to your guide. Here is it, and thanks for all your help. If you are not promoted to Lieutenant/Captain, how will you continue to support your chief and command staff? What actions will you take in the next 12 months and beyond? We like this answer because it shows that you (1) really want the position, (2) have properly prepared yourself for the position, and most importantly (3) will continue to train and prepare for the position. Do not say anything negative about another candidate, or even hint that you will pout if not promoted. Thanks again Glenn, and you can find this fire lieutenant interview question in our Fire Officer Interview guide.